Woodbridge, VA---For the second consecutive year, the Potomac Nationals have been named as the top promotional franchise in the Carolina League season, and thus a finalist for Minor League Baseball's Larry MacPhail Award. One of the top honors in Minor League Baseball, the MacPhail Award goes to the club that demonstrated the most outstanding and creative promotional effort throughout the season. The MacPhail Award stands as the Carolina League's Marketing and Promotional Award. "It is a tremendous honor to once again be recognized by the Carolina League for the invaluable collaborative efforts put forth by our amazing front office staff, who worked together to assemble and execute one of the premier promotional schedules in Minor League Baseball during the 2018 season for our loyal P-Nats fan base," said Potomac Nationals General Manager of Sales, Bryan Holland. "As a franchise, the Potomac Nationals treat the planning and implementation of our promotions, themed nights, giveaways, and marketing efforts, as serious business, and our club is truly humbled and grateful to be honored with back-to-back Carolina League Marketing and Promotional Awards," said Holland. 2018 saw the P-Nats draw more than 235,000 fans to Northwest Federal Field, the second highest total attendance figure in franchise history. With a different promotion or event every game during the 70-game home campaign, there was always some sort of family fun entertainment to go along with the Northern Division Championship baseball club on the field. "To now be nominated once again for the Larry MacPhail Award amidst the most creative, innovative organizations in all of Minor League Baseball is such a wonderful privilege for our franchise," said Holland. 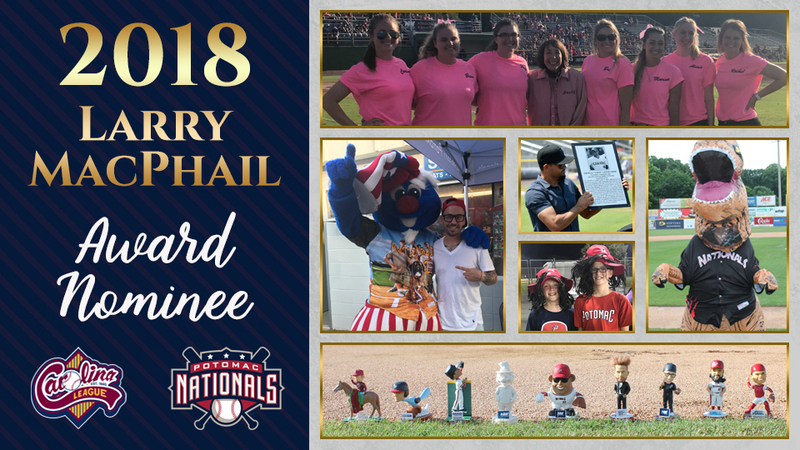 "Our front office staff looks forward to delivering another top-flight promotional schedule for the Potomac Nationals' upcoming 2019 campaign as we continue to work towards raising the bar of promotional excellence." As has been the case for many years, the Potomac bobblehead roster during the 2018 season pushed the envelope further than ever before. From Trea Turner as a half man, half road runner, to Michael A. Taylor's "Tater" Potato Statue, to Bryce Harper's "Real Slicked Back Hair" bobblehead for Grease night, Potomac raised the bar in both creativity and execution. In total, eight bobblehead/statues were available for fans as stadium giveaways throughout the season. The creativity of the P-Nats didn't stop at bobbleheads, as 10 unique theme jerseys graced the confines of Northwest Federal Field. Nine of these custom jerseys were worn for one-off theme nights/events, while the team wore special Military Appreciation jerseys on Sundays as well as select dates throughout the year. These jerseys were auctioned off at the ballpark to fans throughout the season, while proceeds benefitted various local non-profit organizations. With Kentucky Derby Day jerseys for the annual Run for the Roses, annual Autism Awareness jerseys, Jurassic Park jerseys for the 25th anniversary of the original film, Stranger Things jerseys to celebrate the hit series, annual Star Wars jerseys, Jamaican flag style jerseys for the 25th anniversary of Cool Runnings, out of the box Art in the Park jerseys, Cosmo Kramer themed lobster jerseys for a night inspired by his namesake, Grease jerseys for the 40th anniversary of the film, and Sandlot jerseys for the 25th anniversary of the baseball classic. Upping the ante from 2017, the P-Nats had eight "Celebrity Autograph Signing" nights throughout the season. Former Major League Baseball star Jose Canseco kicked off the slate, while Robert Wuhl made his way to Northwest Federal Field as part of Potomac's celebration of the 25th anniversary Bull Durham, NHL Hall of Famer Rod Langway appeared for Washington Capitals Night, Harvey Grant and Phil Chenier were in town for Washington Wizards Night, Didi Conn visited The Pfitz for the Grease 40th anniversary celebration, Chauncey "Squints" Leopardi signed autographs for The Sandlot 25th Anniversary night, Coco Crisp was on hand as he was inducted into the Potomac Baseball Hall of Fame, and The Godfather (Charles Wright) showed up for WWE Night. The most expansive celebrity slate in franchise history provided at least one special night for fans of all ages! With all of the out of the box promotions, giveaways, and celebrities, the national media caught wind of many of Potomac's ideas and theme nights. The Bull Durham re-creation video made MLB's Cut4 and got a retweet from Bull Durham star Robert Wuhl. The Kentucky Derby Day jerseys were featured on both USA Today and Yahoo Sports. Baseball America featured the Trea Turner Road Runner Bobblehead. MLB Network's Intentional Talk TV show featured Potomac's "Salute to Jorts" video as well as the entire promo schedule, while the Bryce Harper "Real Slicked Back Hair" bobblehead made Sports Illustrated. "Promotional prowess has long been a barometer of merit in the professional baseball landscape, and frankly the lifeblood of our industry. To be honored by the Carolina League, and specifically by our fellow clubs, for the second straight season, as the franchise who exhibits the most dedication in our league towards promotional and marketing excellence is a very prestigious honor," said Potomac Nationals General Manager of Operations, Aaron Johnson. "We look forward to defending our consecutive Carolina League Marketing and Promotional Award titles during the 2019 season, and on behalf of the Potomac Nationals, congratulations to all the clubs around Minor League Baseball who are being recognized for their promotional and marketing accomplishments during the 2018 season." After taking home the award in 2018, and with so many other creative promotional squads in the Carolina League, Potomac raised the bar and made a statement with a second straight award-winning season. The P-Nats' promotions continue to be on par with the best of the best in all of Minor League Baseball. The Potomac Nationals of the Carolina League play at Northwest Federal Field at Pfitzner Stadium in Woodbridge, Virginia, and are the Carolina League affiliate of the Washington Nationals. The Potomac Nationals have claimed five Carolina League Championship titles (1982, 1989, 2008, 2010, and 2014) and 10 CL Northern Division Championships. Sponsorship opportunities for the P-Nats' 2019 season and beyond are available, as well as all-inclusive corporate picnic outings to watch the future stars of the Washington Nationals at The Pfitz. 2019 Potomac Nationals season tickets and mini plans will be on sale soon. For more information on Potomac Nationals 2019 season tickets, mini plans, group outings, picnic packages, fundraisers, and all things Red, White, and Blue, visit the P-Nats online at www.potomacnationals.com, follow the P-Nats on Facebook (@PotomacNationals), Twitter (@PNats42), and Instagram (@pnats42), or call the Potomac Nationals' Extreme Custom Collision Ticket Office at 703-590-2311.